Pole and beam post barn what? Making the decision to add a barn to your property can be a daunting task once you begin to wade through your options. This is especially true if you’re unfamiliar with the jargon. Pole barns and barns built using the post and beam construction method are two of the most common building styles. While these terms may sound similar to one another, they are actually quite different. Let’s demystify the process with a few simple definitions. Post and beam construction relies on the use of high-grade heavy timbers to create dramatically open interiors. This construction method is celebrated for its structural durability and environmentally preferable approach. The use of a monolithic concrete slab for the foundation scores LEED points, adding further value to the barn. With pole barns, chemically-treated posts are buried in the ground or set into concrete casings. This creates vertical support for the structure. Generally, people like pole barns for their affordability and easy assembly. Both building styles have their advantages, depending on needs and challenges. That said, one construction method is an objectively better long-term investment—and that’s a post and beam building. 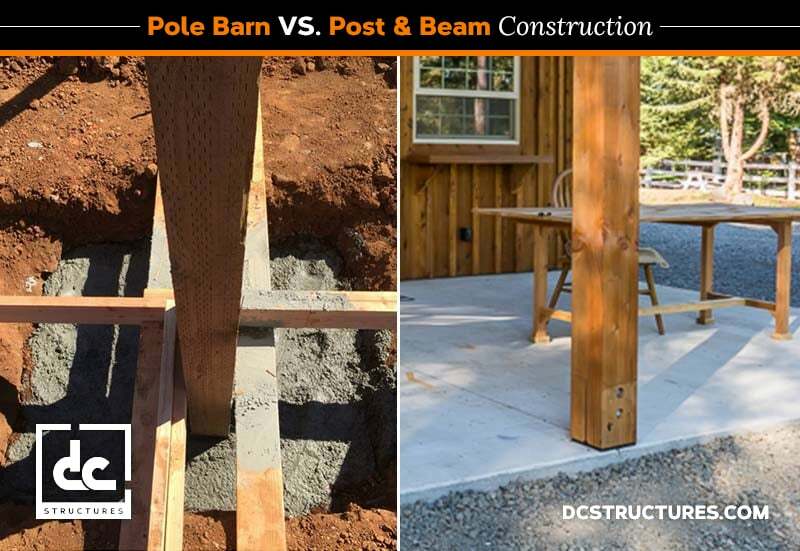 Pole barns serve as a cheap and quick alternative to post and beam barns. Fast and inexpensive are great for some things, but a building may not be one of them. When something is cheaper up front, it’s safe to assume that maintenance costs over time may not outweigh immediate savings. A cheap barn probably isn’t built to last. Even with proper maintenance, a pole barn will expire after 40 years or so. Timber posts inserted into the ground or concrete casings are bound to rot, regardless of what chemicals they are treated with. By contrast, post and beam buildings will remain standing for centuries if given the appropriate upkeep over time. Post and beam construction never requires the use of treated lumber. Untreated timbers are safer for barn animals and the environment, as well as more attractive. DC Structures has a proven record of success designing and assembling post-and-beam barn kits. Take a look at our catalog to see how we can take your vision and turn it into concrete and wooden reality.